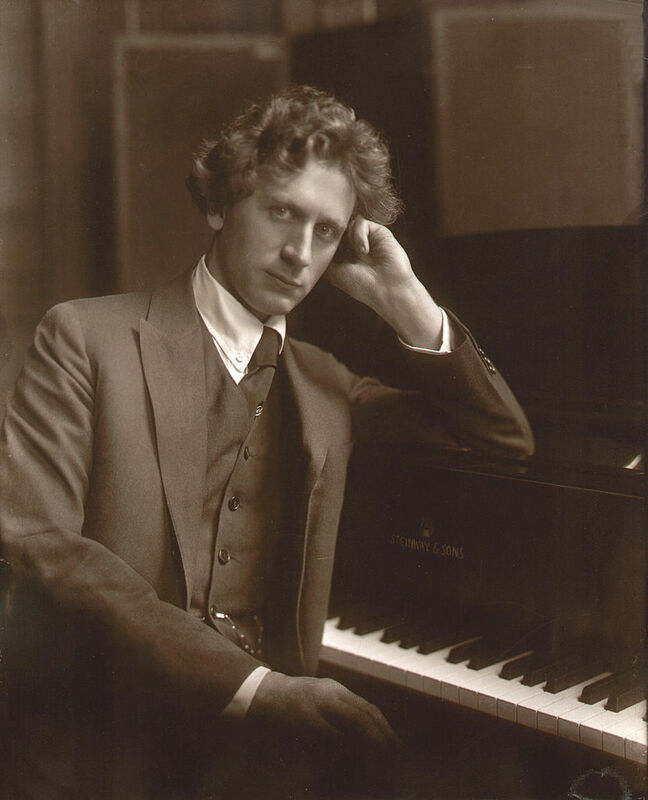 Aux Arcs Music is announcing the formation of a Commissioning Consortium to produce an edition of Percy Grainger’s 1905 Lads of Wamphray Ballad for Wind Band and Chorus. As the arranger and editor, Chalon Ragsdale looks forward to putting the insights gained from a 35 year career of producing editions of the music of Percy Grainger toward a modern edition of Lads of Wamphray Ballad, Grainger's first big project for Wind Band. We believe Lads of Wamphray Ballad will become a significant addition to the repertoire for Wind Band and Chorus, and will lead to additional works for that combination. We invite you to join the Consortium and be involved in bringing the project to fruition. Consortium Membership is set modestly at $200, with the agreement due by September 1, 2017, and payment due by December 1, 2017. Grainger’s experiments with the wind band started about 1905 in England with his setting of Lads of Wamphray Ballad for Men’s Chorus and Band (Orchestra). His original unfinished score of some 120 measures is a riot of boldly imaginative scoring, including parts for 2 oboes, 2 English horns and 2 bassoons, parts for a 6 member Sax-Reed complement, and parts for a section of Saxhorns (brass instruments of conical bore invented by Adolph Sax) in addition to a fully instrumented orchestral brass section. Grainger’s letters from the period indicate he deemed the scoring a disaster (it would have certainly been a challenge as to balance in an acoustical setting, assuming a men’s chorus of less than 1,000), and he executed a virtual overhaul of the scoring. In any case, his completed scoring of the Ballad for a more modest instrumentation of Piccolo, 2 Flutes, 2 Oboes, English Horn, 2 Bassoons, Contra-bassoon, Eb Clarinet. 3 Clarinets in A, Alto Clarinet in Eb, Bass Clarinet in A, 6 Horns in F, 3 Trumpets in F, 3 Trombones, 3 Cornets in Bb (members of the afore-mentioned Saxhorn family), 2 Tenor Horns in Eb, 2 independent Euphonium parts, 1 Brass Bass (Tuba), Kettledrums and strings is an instrumental combination still ahead of its time. Grainger’s scoring of the Lads of Wamphray March in a stand-alone version for Band, finished and presented as a Birthday-Gift to Rose, July 3, 1905 (though receiving extensive revision to 1907) has a scoring only slightly less extravagant, using Flute, Eb Clarinet, Oboe, 3 Bb Clarinets, Bass Clarinet, Bassoon, Eb Alto Sax-reed (Saxophone), Eb Baritone Sax-reed, 3 Bb Cornets, 4 French Horns in F, with optional 5th and 6th Horn parts, 2 Tenor Trombones and Bass Trombone, 2 Euphoniums, Eb Bass (Tuba), and BBb Bass (Tuba), String Bass, Kettle-drums, Side-Drums and Big (Bass) Drum. Clearly, Grainger had a full-realized sense of the “combined choirs” approach that would be his wind-writing hallmark; he also demonstrated a significant sense of confidence in this new medium, brought about at least partly by his opportunity to have his new pieces rehearsed and performed by the excellent Band of the Coldstream Guards in 1904-1905. Our new edition of the Ballad is projected to be for Piccolo, 2 flutes, 2 oboes, English Horn, 2 Bassoons and Contrabassoon (opt. ), Eb Sop. Clarinet (opt. 3rd flute), 3 Bb Clarinets, Bass Clarinet, Conta-bass Clarinet, Soprano, Alto, Tenor and Bari Saxes with Bass Sax (opt. ), 4 Trumpets, 4 Horns, 3 trombones, 2 independent Euphonium parts, Tuba, String Bass, Tuneful Percussion, Piano, Harp, Tin Whistles (opt.) and Men’s Chorus with the option to expand to Mixed Chorus.